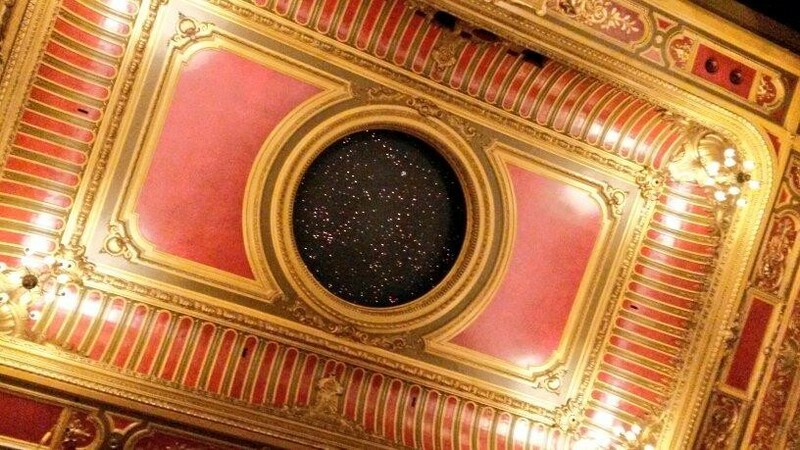 Some say that Haydn’s operas are only done once in a blue moon and it may be that director Cal McCrystal has absorbed this very literally, overseeing a broad comic staging that makes plenty of ‘blue’ jokes about the inhabitants of the moon – not to mention those looking up at it. Christopher Bucknall directs the Old Street Band from the harpsichord in a lively performance in the pit. Just as the contemporaneous production sparkles some fine new costumes from designer takis, so the music skitters along in its period instrumentation without simply seeming thin. 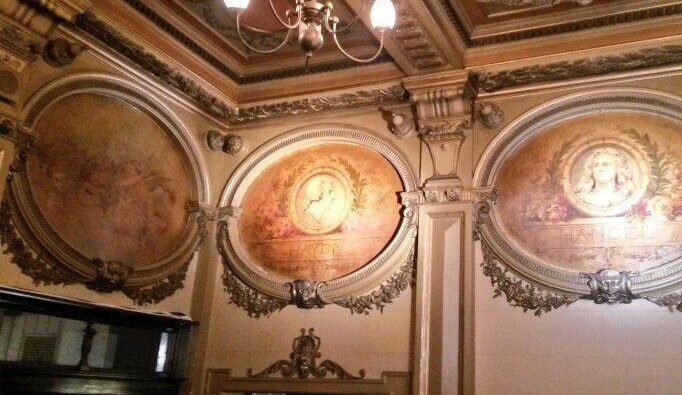 The cast are helped in their various arias by Bucknall whom one can clearly see repeating sung phrases to encourage his orchestral musicians in their phrasing. 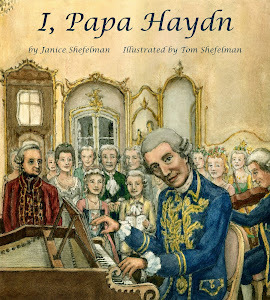 Given that Joseph Haydn is often referred to as ‘Papa’, it would come as no surprise to learn that his music has often been a source of interest for children. His good humour hopscotches across age gaps: one can certainly imagine adults and children alike responding to the ‘Surprises’ or ‘Toys’ of the symphonies so-named, as well as to the programmatic music that brings the menagerie of The Creation to life. 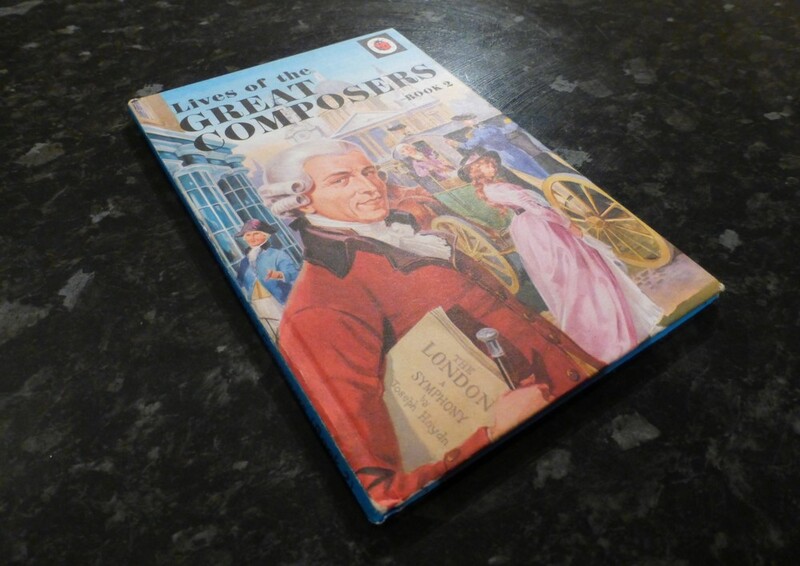 Yesterday we chanced upon an old copy of the Ladybird book Lives of the Great Composers (Book 2). Published in 1972, the slim volume covers Handel, Haydn and Schubert. Alongside Ian Woodward ‘s potted outline of their life and works there is space for some of the more colourful events in their lives. All are illustrated by the inimitable Martin Aitchison. Aitchison’s picture of Haydn shows a scene in London in front of St Paul’s Cathedral (which Haydn certainly visited in 1792). holding a copy of ‘The LONDON Symphony’ under his arm, he throws a knowing glance at the artist – and in turn an attractive young woman in the background throws a glance over at him. Even a gentleman in a passing carriage is moved to try and catch a glimpse of the celebrated composer. 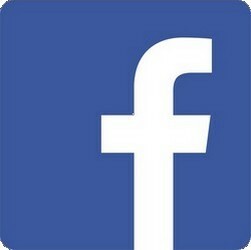 Haydn’s life and work has also inspired American publications. Two examples we have come across recently include Thomas Tapper’s primer ‘Child’s Own Book of Great Musicians: Haydn’, originally published by Theodore Presser & Co. and the more recently created I, Papa Haydn by Janice and Tom Shelfman (right). You can read more about the Shelfman’s book and the adventure they had in researching it in Eisenstadt via their blog, here. Of course, with music as the central focus of Haydn’s life, any story would be best served with associated audio. Like the books, videos come in all sorts of editions, from this straightforwardly narrated primer to a charming, up-to-date, stop-motion video which may as well have been done as a bit of fun between mother and daughter. It appears that the legacy of Haydn’s life and music is one that people feel able to share with their young ones to inspire and amuse without condescension, surely tenets of his work at its time of writing.